On October 28, the New York City Landmarks Preservation Commission will hear public testimony on the proposed Prospect Heights historic district. The hearing will begin at 1:15PM in the LPC Public Hearing room at 1 Centre Street. The hearing is the second step in the process of Prospect Heights being designated as a New York City historic district. Landmarking has received the support of hundreds of Prospect Heights residents. It's also critical that community members attend the public hearing (and testify) in order to demonstrate the urgency of landmarking our neighborhood before another historic building is lost or irreparably altered. Please make every effort to attend this important event! Whether you attend in person or not, please write your own testimony in support of designation in Prospect Heights, and email it to landmark@phndc.org. At its July 15 meeting, the New York City Landmarks Preservation Commission voted in favor of "calendaring" the proposed Prospect Heights Historic District for a public hearing on October 28. At the October 28 hearing, public testimony will be heard with respect to the proposed historic district. PHNDC.org will post the time of the hearing when it is published. 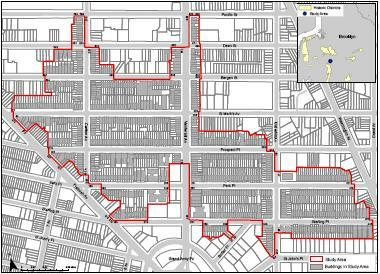 Following comments from PHNDC, other civic organizations, and neighborhood residents submitted after its April 9 community forum, the New York City Landmarks Preservation Commission has revised the boundaries of the study area for a Prospect Heights Historic District. On Tuesday, July 15, 2008, the New York City Landmarks Preservation Commission will vote whether to calendar the proposed Prospect Heights Historic District for a public hearing to be held on October 28, 2008. Please note that the time and location of this meeting have changed. The meeting will now be taking place at 1:45PM, and will be held at the Landmarks Preservation Commission offices at 1 Centre Street in Manhattan. Calendaring is the first step in the designation process. Once a building has been calendared, it is marked with a "C" in the Department of Buildings database. Any work that requires a Department of Buildings permit will also need to be reviewed by the Landmarks Preservation Commission prior to a permit being issued. Public testimony will not be taken at the calendaring meeting, but residents are welcome to attend. In the event the Commission votes to calendar the Prospect Heights historic district for a vote on designation on October 28, the public will have an opportunity to speak at that meeting. Residents with questions about historic designation may call Claire Kendall at (212) 669-7925.